You'll need Miro to make this work! 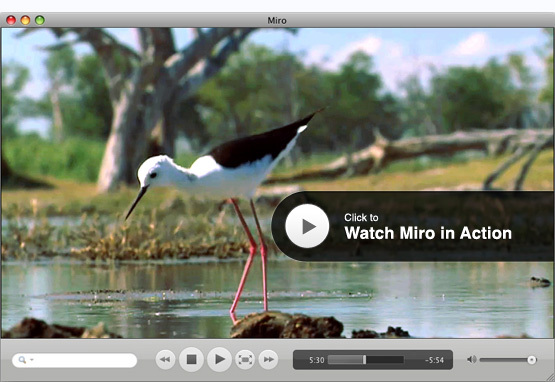 Miro is a free and open source HD video player. It's adware and spyware free, and is made by a non-profit. Already got Miro? If you already have Miro installed, but it didn't open up and subscribe you to these channels when you came to this page, click here to download the Miro subscribe file and then double-click it. Miro is cross-platform and 100% free and open-source. Built by a non-profit company and volunteers around the world. View All Platforms: Miro has a strong community of users that build and back various other versions of Miro. Miro is a project of the Participatory Culture Foundation, a non-profit organization. The Miro name, logo, and icon are trademarks of the Participatory Culture Foundation (PCF). All text and image content on getmiro.com, unless otherwise specified, is released by PCF into the public domain. This does not include the Miro name, logo, and icon. This does not include the software code, which is licensed under the GPL. Please share, re-publish, re-use, and re-imagine this site.